Ask questions, get information about the day's events, or just stop by and say hello to our deans and staff advisers. Information about all our majors will be available, along with the opportunity to speak with the major advisers and world-class UCD faculty. Learn about how students can create a sense of community by forming relationships with peers, staff and faculty; this program provides hands-on academic and extracurricular activities; students will be exposed to UC Davis biology and develop a better understanding about the value of research. For nearly 50 years, BML has also provided hands-on training to students who have become leaders in the fields of marine science and policy. BML’s long history of research and training has contributed invaluably to our knowledge of coastal systems and the policy that protects them. The BUSP program is an intensive enrichment program for undergraduates who have a strong interest in undergraduate research in biology. BUSP’s two-year program is a specially designed academic program that helps to provide academic guidance and support within their first years at UC Davis. Check out our teaching facilities and discover the many resources available to our students. The building will be open for touring between 10:00 AM and 1:00 PM, so there will be plenty of time to take it all in. Please check-in for a tour at the info table in front of the Sciences Laboratory Building. 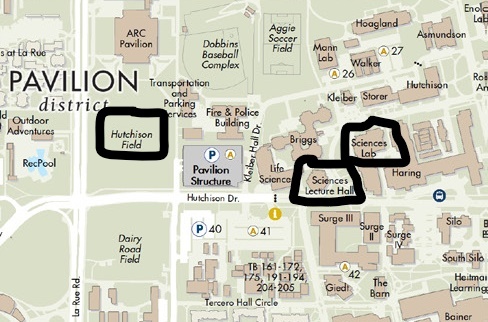 Locations: Sciences Lab Building, various labs within the building. Lower division laboratories: You may soon be a student in lower division lab courses when taking the Biology 2ABC series. Come see the plethora of specimens you will be studying in these hands-on courses. Upper division laboratories: Visit with faculty and graduate teaching assistants and view equipment and course content materials in our high tech, sophisticated teaching facilities for upper division students. Many of our undergraduates take advantage of the opportunity to participate in the incredible research that happens within the college—find out what they've been doing! Experience a biological sciences lecture by the college’s very own Associate Dean, Dr. Michele Igo.